I don't know about you, but my craft supplies tend to find themselves shoved into boxes and bins without any rhyme or reason. One of the items on my ever-growing list of things to do is to tackle this organizational mess. I mean, it's utter chaos! Applying a few (or all) of these brilliant craft room storage ideas would definitely be a step in the right direction. If your craft supply situation is similar, read on! 1. 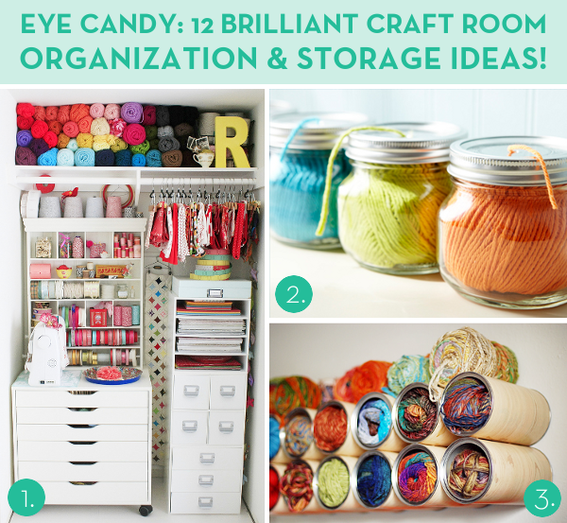 If you aren't lucky enough to have an entire room dedicated to crafting, consider utilizing closet space! 2. Repurpose food jars into handy yarn and spool holders! 3. Old coffee or oatmeal cans make excellent wall cubbies -- cover them in decorative paper for a clean look! 4. Attach jar lids to the undersides of shelves to create clutter-free storage. 5. 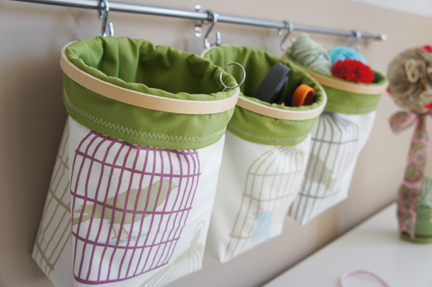 Make the most of the space you have by using over-the-door shoe organizers as craft supply pouches (great in the kitchen too, as shown here)! 6. A wall-mounted craft and wrapping paper station is a great solution for small spaces or closets. 8. Turn tin cans into a craft supply caddy! 9. Make your own magnetic memo board for displaying project inspiration, notes, and ideas! 10. Embroidery floss and thread looks great (and stays tangle-free) wrapped around inexpensive clothespins. 11. A wire door organizer makes a great closet craft station! 12. And finally, turn tin cans into cute cork board supply cups! What are some of your favorite methods for keeping your craft supplies organized? Do you have a system or other clever storage ideas? Share your thoughts and suggestions below! I use empty toilet rolls for embroidery thread storage. Flatten the roll, then fold in half length-wise. Tuck one end of floss into the fold & pinch closed. Wrap rest of skein around & tuck other end into fold as well. I can get 3 skeins on one roll. The colors of the floss show up very well against the taupe. I've been saving the little containers from baby food. They're plastic with lid's. I use them for alot of small items. They can be stacked upright or on their sides. If you have ALOT of stuff, try taping one of the items on they outside of the container so you don't have to open them up. Find it at fisrt glance. Remember all those beannie babies that everyone had to collect? Well, the clear boxes that you used to display them are great for anywhere that you don't want to waste time finding things. I used them to straightened up my medicine cabiets. Bandaides, medication, razors, you name it. They're the exact size to fit in there. Use the top and the bottom of the display box. You can even have one for each member of the family. Sooo much easier. And it keeps the cabinet cleaner. If anything leaks out of anything, it's easier to clean one small display box than it is to clean the whole shelf. I like to buy the clear containers used for eggs. I use them in my refriderator. Much easier to pull out one container and clean then to pull everything out and clean. If you use square container's of any kind will give you extra space then using something round or oblong. Plus it looks much neater. THIS IS GREAT! I've been looking for a way to organize all my crafting materials. Thanks very much for sharing! I recycled somewhat large old hard suitcases, labeled them ie. christmas, scrapbooking, etc;fill them up and pile them up as bedside tables in our bedroom as well as guest room. Could be covered with fabric. When needed, I just grab the suitcase I need. Makes for easy clean up too. This really allows a lot of storage (12suitcases). Hi, I'm not sure if I'm doing this right or not, but this comment is for Pat. I found this awesome site & sent it to my mother. http://mamiejanes.blogspot.com/2011/07/welcome-to-my-studio.html She has a computer room & wanted to be able to work on 'one craft at a time' in that room, instead of working in her basement. It inspired her so much that she got started the very next day! I suggested for her to put up a couple of shelves & then add all sorts of baskets, containers & gym locker bins to store her craft items in. Mix & math & it will look like a collection over time. If I may suggest, without seeing the set up of your room, arrange your dinning room things on the main wall that everyone sees as they enter your home. Put your craft area on one of the side walls. Maybe your painting area could go by a window for natural light. Look for a thrft store desk or large table or maybe you could find used kitchen cabinates & put a counter top on them. New laminated ones are very reasonalbe. Cabinates would add storage underneath & a large work surface! Sometimes you can find a large 5 shelf unit for around $30 at the large home improvement store. I hope this helps! If you want to send me pictures of your room, maybe I could figure out something better. iluv2craft@sbcglobal.net Good luck & most of all, have fun with it & start collecting!!! I need help on turning my dinning room into a dinning/craft room. It is about 10x10 in size and the first room you see when you walk into our home. There isn't a door, it is open on one side. Currently there is a round dinning table, an antique buffet, and a sewing table in this room. I paint pictures, glassware...you name it, sew, scrapbook and a wide variety of other crafts. All my craft supplies are crammed in a closet of a very small guest bedroom. Stuff is also shoved in the drawers of an old dresser, on the floor and under the bed. All my in-process projects are spread all over the dinning room. It takes me forever to find anything. As well as its embarrassing when people come over and they see the dinning room as soon as they walk in. I'm newly retired and finances are very tight. So... yeah, I need help or a miracle. I'll take either. Love the article! Thank you for these wonderful ideas! I found one of the hangers that hang in your kitchen to hold kitchen towels. Instead I attached to the craft room wall and put my spools of ribbon on the arms that swivel. I need an idea for separating all the small things to add to scrapbooks. The way they are now I have to pull them all out to look through them to find what I want. Need help storing artificial flowers. I have them in clear tubs now, but beginning to take over! Great ideas. Now can you come over snd h3elp me? L.O.L. Paige - A ribbon "hanger"? That's brilliant! I set up a makeshift gift-wrapping station in my dining room during the holidays, and had a dozen spools of ribbon scattered everywhere... I took a hanger from the dry cleaner (the wire ones with the cardboard tubing on the bottom) and pulled the wire out of one side of the tubing, slid the ribbon spools on the tube, put the wire back into the tube and hung it on the towel bar on the inside of a closet door. It worked great for quick cutting (and measuring even lengths of multiple ribbon!) and eliminated 90% of my clutter! Rachel, those are fantastic! What an awesome idea. I created these little bags with scrap fabric and embroidery hoops and work brilliantly for wrangling small items! the clothesline peg idea is great. & my favorite is the suspended jars under the shelf. that's awesome, i am going to find something somewhere to jar and then do that!